Nowhere Near by Chun Kai Feng. There is little doubt that commonplace things and objects thrill the artist. 11 artworks presented in this solo exhibition by Chun Kai Feng each bear some familiar semblance from signs, objects found in public places: the steeple of a church, a kitchen window, window grills, carpark entrance sign, incense paper burning drums, 7-eleven motif, railings and flip-flops each serve as recognisable symbols. Yet these commonplace, utilitarian shapes and forms are departures for the artist’s formalistic and exploratory treatments, rather than deliberate attempts to create nostalgia. Equally, they are departures from Chun’s usual neutral, grey-black-white colour schema. Evident from the witty titles, the artworks are humorous rather than subversive as some might imagine. I would like to offer a few personal observations and comments about Nowhere Near, which I hope deepens our understanding of these artworks. For instance, a different reading of the contradictory title—you can’t be nowhere when you are near—would suggest ambivalence or ambiguity. Multitude of greyness, as opposed to totalitarian rule or anarchy, fascinates the artist. In this light, we might begin to interpret the works in more subtle nuances than simply abstracted forms of familiar public housing icons. As the artist’s intent is well documented in the companion publication, I would instead attempt to interpret these subtle nuances, implied or explicit, behind Chun’s works. Making the familiar unfamiliar. In research lingo, researchers are often required to take a disinterested view (or lacking bias), in order to study something as objectively as possible. This is different from being uninterested, which means not being interested. By doing so they might arrive at a surprising, unexpected new knowledge about the thing they are researching on. Similarly, Chun has taken some similar symbols from Housing Development Board (HDB) estates, and deconstructed them into a simple, symbolic binaries. As with his earlier works from Me, Myself and All (2007),the question of the ‘private’ and ‘public’ are surfaced. In the case of Nowhere (2012), a ‘kitchen’ is protected from leering eyes by frosted glass, yet we know it is non-functional and a gallery wall lies behind it. Similarly, in Before Sunrise (2012), a symbol of a regulated carpark is romanticised by abstraction and an unusual title. While a sunrise cannot be privately owned, the land from which it is viewed could be. Similarly, a public carpark in a housing estate is not entirely public as most parking lots are reserved for residents only. 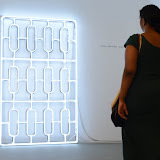 Conceptual definitions of private and public aside, the artist’s interventions might make the familiar unfamiliar, in order to challenge the viewers’ understanding ‘design interventions’ commonplace to HDB estates, and to question our individual relationships to these spaces. Does the ability to relate to these artworks make us more Singaporean? Or if we have lived in condominiums, would we find these less familiar and appealing? How does the aesthetics of these objects, the spaces they designate affect the way we view good design—the type of design that can change the world for the better? Aestheticising industrial materials. The use of materials in Nowhere Near is more varied than Chun’s earlier assemblages. The use of stainless steel, aluminium, tempered glass, neon tubes, automotive spray paint, cement-grain laminate and laser-cut plastic suggests the artist’s interest in commonplace taken-for-granted industrial materials, just as how the minimalists were interested in industrial materials and processes. Chun however, favours a mix of hand-crafted and machine assisted production techniques. Craftsmanship hangs in a fine balance of being hand-made and machine-made. Like Warhol’s silkscreens, the tiny imperfections are as much part of the aesthetics, unsettling and challenging mechanical and serialised exactitude. Yet each work is unique, and the artist has resisted using multiples or ready-mades to give his works a physical critical mass. Going multiple would have been kitsch. Instead, we are confronted by the careful selection of industrial materials, manipulated to blend in the real world yet hampered just enough by the shimmering colour, awkward scale, dysfunctionality or personification. If we trace Chun’s influence back to Glasgow School of Art, it might not be surprising that he might be sensitised by the nature of materials, and its associated conceptual properties. Material dictates the form. Curating Site-specificity, when might not be needed. A lot of effort has been put to place works that deal with the gallery’s unique movable wall system, and creating pockets of spaces to fit different works. The sense of play is noticeably absent, though this might be deliberate to suggest a clinical environment. While this to some extent showcases the works collectively, achieving a consistency of surprises at every corner, I feel they do not bring out the artwork’s individual merits. Displaying the artworks in pairs and harsher spot-lights, might dramatically alter the space favourably. Hanging works in pairs, after assuming a certain relationship between two works might create a healthy visual tension. Stronger spot lights, might remind one of a staged standup comedy night, but they will also put some drama which the works deserve. For instance, All Things come into View (2012) might have benefited from a dimmer space, with a strong side light to cast a dim shadow not unlike the streetlamps in shady open air carparks. Despite my two cents worth of criticism, I think the artist is successfully departing from nostalgia and creating a serious style of his own. By distilling and abstracting chosen forms and symbols further, like Totem (2012) or Same as It Ever Was (2012), and Chun might just get the hang of exploring other industrial materials and scale, and create a whole new trend of sculptures and assemblages in Singapore. a limited edition companion publication Getting the Hang: An exchange between Chun Kai Feng + Magdalene Chua is available from FOST for a bargain price of S$5. While stocks last. post-script: Clicking on the ‘image’ at the top of this post brings you to a picasa album of the artworks in the exhibition. While these images pale against the experience of seeing and walking around the actual artworks, I hope they serve as an illustration, and documentation of the stimulus that led to the writing. If time permits, I would like to conduct an interview with the artist too. So Akan Datang (Malay phrase for “coming soon”).